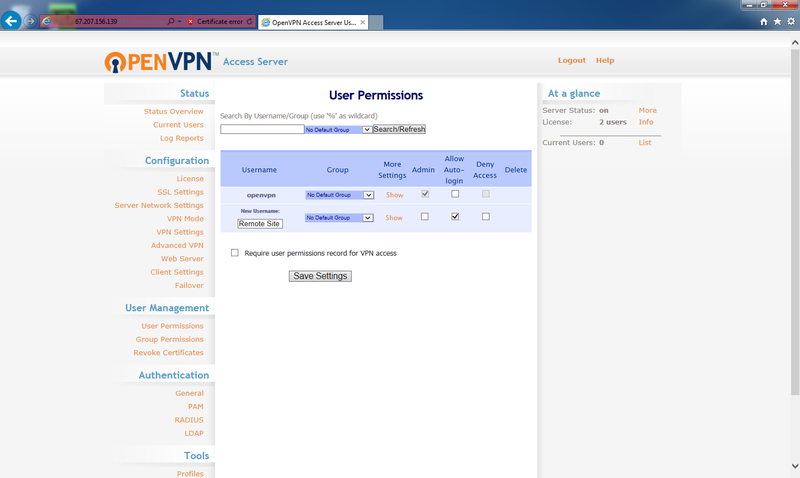 This will configure the users allowed to access the VPN tunnel using the web interface of the OpenVPN Access Server. These users will have access to the remote network. You WILL need to know the network IP addressing of the remote network (an IP address in the network and the subnet mask. More details below). This URL was given at the end of the OpenVPN Access Server configuration. 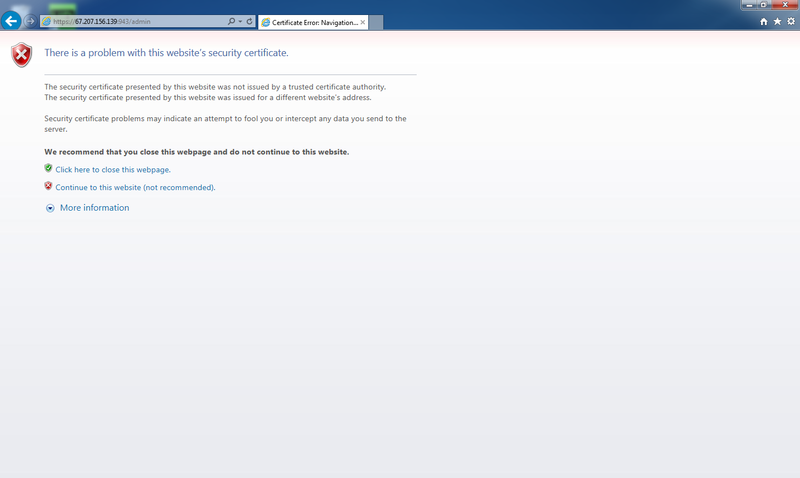 You will be presented with a certificate error. 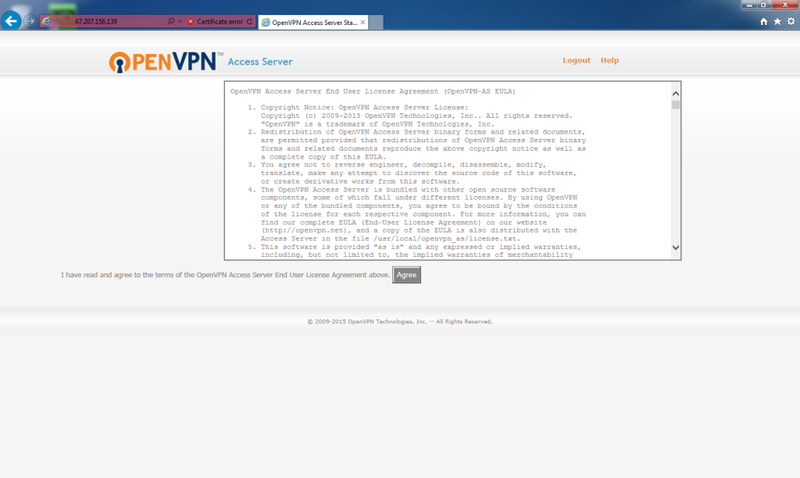 This is because the OpenVPN Access Server has a self-signed certificate. You will need to bypass this error. Steps required depend on your browser and may require an exception to be added to for this URL. Adding and confirming the exception is a precaution instituted by the web browser to check that you are aware that you will be bypassing this security message. 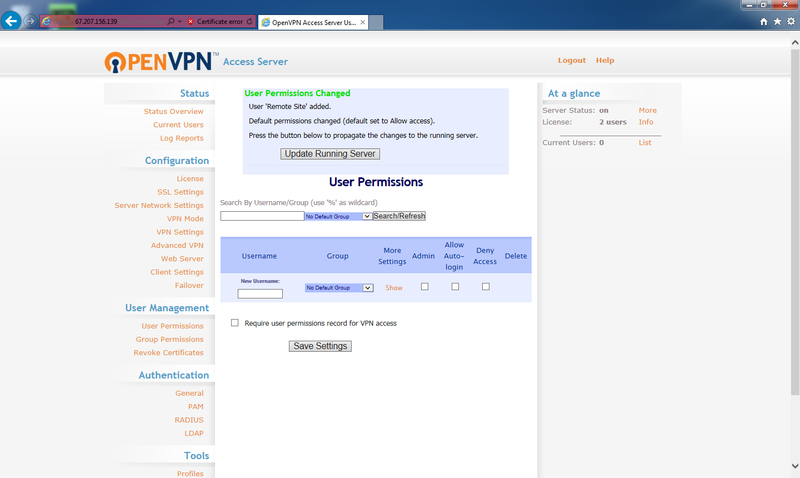 For password, enter the password you set when running the passwd openvpn command. When first logging in, you need to accept the license agreement. Click Agree. The user for the gateway server on the remote network is created. At the Status Overview page, under User Management, click User Permissions. This can be anything but must be consistent across the rest of the instructions. Usernames are case sensitive! The user will be added. To update the server, click Update Running Server. With the Remote Site user created, under More Settings, click Show. 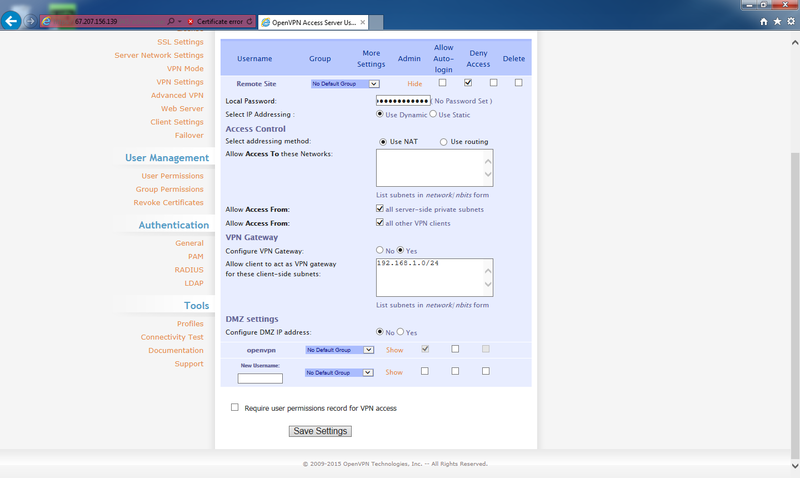 Create a password for the remote network user. 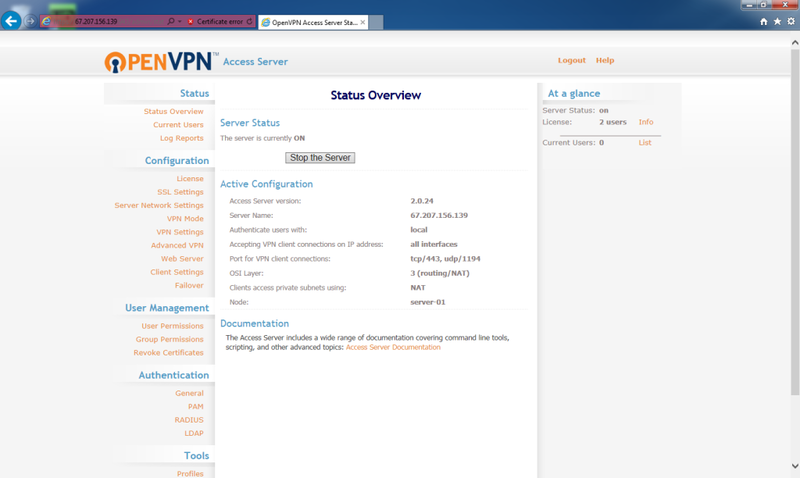 Under Access Control, for Allow Access From, check all server-side private subnets. Check all other VPN clients. 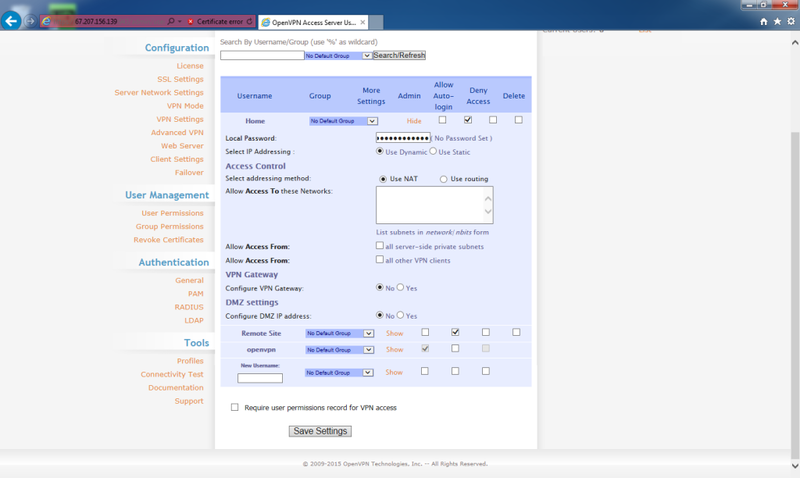 Under VPN Gateway, for Configure VPN Gateway, select Yes. Here is where you will need the network prefix and subnet mask of the remote site network to determine the correct input. Typically a quick ifconfig on the Linux box at the remote site will help determine most of the information. A quick crash-course in IPv4 subnetting and CIDR notation and blocks (Classless Inter-Domain Routing) is needed if you have trouble determining this information. The user settings will be saved. To update the server, click Update Running Server. The home user will be created. With the Home user created, under More Settings, click Show. Create a password for the Home user. 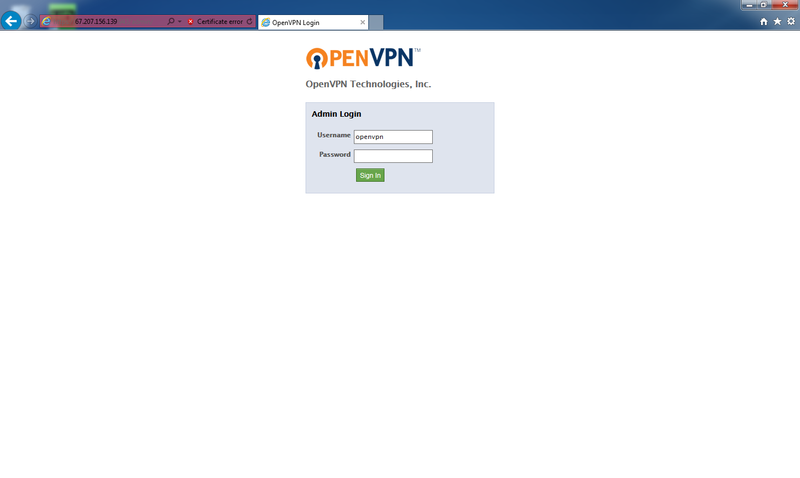 This will used to download the OpenVPN Connect application. 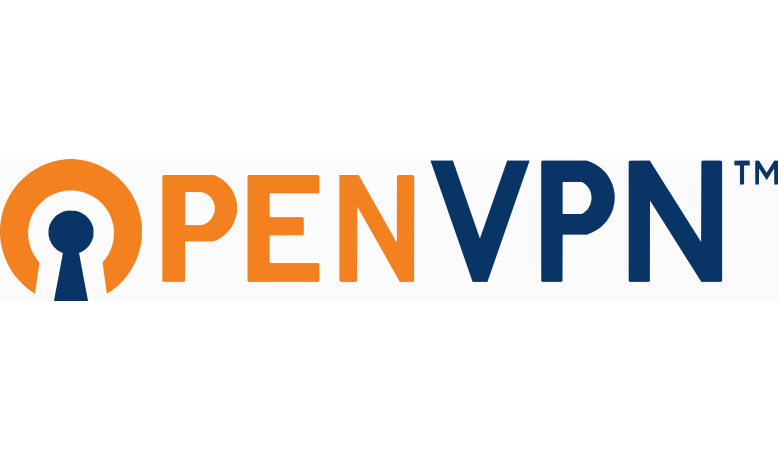 OpenVPN Access Server users are setup! Settings on the More Settings pages for each user can be made on the fly after the fact and have no effect on the download profile. As many ‘Home’ users can be created as desired. Only two concurrent users can be connected to the VPN.